La Academia de los Nocturnos was founded in 2008. With their very first program Dolcissimo Tormento (early Italian and Spanish Baroque music), the ensemble was selected to take part in the Fringe of the Utrecht Festival. Shortly after, and furthering their interest in early Italian Baroque music, they presented Frescobaldiana, integrally dedicated to the works of Girolamo Frescobaldi, in the concert series of the University of Valencia. In 2011 and 2012, the ensemble has collaborated with the Dutch musea De Lakenhal (Leiden) and Museum Gouda, where they presented programs connected with specific exhibitions of Renaissance paintings: Europa 1500 is a journey through vocal and instrumental pieces conforming an European “hit parade” at the beginning of the XVIth century, and Secretz Regretz is a selection of music illustrating the life of Margaret of Austria, Regent of the Netherlands and one of the most powerful – and misfortuned – ladies of the Renaissance. 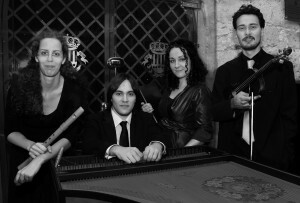 The ensemble works actively towards the rediscovery and appreciation of Spanish repertory, collaborating closely with the musicologist Raúl Angulo (Ars Hispana): in 2012, La Academia de los Nocturnos has premiered the Opera Armonica en estilo ytaliano by Antonio Literes in The Netherlands. Along the same line, 2013 marks the beginning of a series of projects dedicated to the Spanish composer Sebastián Durón (1660-1716), that started in The Hague in February with the presentation in concert of the program Al Açento Divino (a selection of his villancicos), closely followed by a concert in the Cathedral of Valencia featuring his music for the Holy Week. La Academia de los Nocturnos undertakes also important initiatives towards the dissemination of specialized musical formation related to historically informed performance. In July 2012, the I Valencia Early Music Course took place, in collaboration with the Conservatory of Valencia, and focusing on theorical and practical aspects of relevance to the performance of the polychoral music of Giovanni Gabrieli (in memory of the 400th anniversary of his death). The 2nd edition (July 2013) has been devoted to Sebastián Durón and his sacred music. La Academia de los Nocturnos will take part in the next concert season (2013-2014) of the Dutch foundation Musica Antica da Camera.